The SCAETH MYTHOS, a vision of horror that will haunt your dreams. The Scaeth lives beneath the surface of our perception. A creature older than time and twice as merciless… with an endless hunger. A being that exists in the shadowy seams of our world… and feeds… without relent. There is more than any of us know. Levels of existence and layers of knowledge that are glimpsed, half-comprehended by a few and hidden from most. Some of it’s miraculous, some of it’s hideous beyond imagining. Everything you think you know is subject to change. Everything is mutable. People, places, the scientific laws that have replaced faith. There is, of course, structure. Boundaries and dividing lines. The walls are thinner than we realise. The Scaeth has hollowed them out, those spaces between the realities, and it squats there like some demonic infestation. Feeding off humanity the way a farmer eats from his fields. Its realm is a torment, a place where nightmares are real. A place you don’t want to be. Few survive, fewer still escape. None do so unchanged. The Scaeth has been with us from the beginning, fuelling legend and myth. It has made itself more than invisible. It’s dressed itself in disbelief behind a screen of scepticism. But it’s still here. These islands are soaked in the Scaeth. And all the sorrier for it. Whereas it once stalked the land, it now has others bring victims to it. Now, it reaches out… and its touch is cold. Bad Pennies is the first story in the Scaeth Mythos. A story of the Scaeth Mythos. Ever notice how some places don’t feel right? No rhyme or reason, they’re just unsettling, without you being able to pinpoint the cause. The vaguely suspicious demeanour of the locals. The pewtered quality of light. The old and indefinably alien smell that blows on the breeze …difficult to say for sure, but there’s definitely something. Bledbrooke is one of those places. It’s always been different to other towns. Quaint and quiet, a little backwater with a somehow dark charm all of its own. Once you get used to it, you wouldn’t want to live anywhere else. It’s not all sweetness and light though. There are problems. A new one has just appeared. The drains on Cinderlake Drive are bubbling unsavoury water onto the street. Even worse, the toilets are blocked and spitting nastiness at some affluent backsides. The town council reckon it’s a fatberg – one of those awful accumulations of wet wipes, grease and other unmentionables. Donald Hobdike, world-weary and well past his prime, this sort of issue inevitably ends up on his chipped desk. When it comes to the sewers in Bledbrooke, he’s seen it all and more besides. Knows them better than he knows the back of his wrinkled hand. 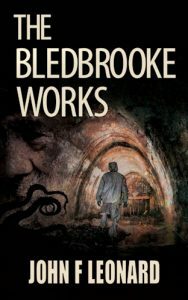 THE BLEDBROOKE WORKS is a tale of everyday unpleasantness and cosmic horror. A short novella of subterranean terror seen through the eyes of an ageing engineer and a young hoodlum. One a pillar of the local community, the other an outsider who wouldn’t know communal spirit if it ran up and bit him on the bottom.